During the winter season, we usually shop for coats, thermal jackets and boots, gloves, and almost anything that can keep us warm. Clothes made of fleece, wool and fur are the mainstays during this season. That’s also to mention that, this is the time when we do cloth layering more than any other time of the year. When I say keeping warm, it doesn’t mean only when you are outside, even inside our homes, we also need to feel comfortably sheltered from the crisp and chilly season. 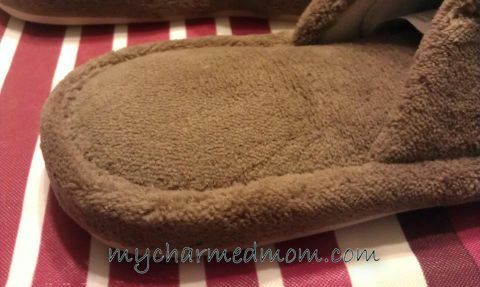 That is why I was thrilled to be given the chance to review Nature’s Sleep Open Toe Memory Foam Slippers. I chose the open toe style in brown mocha, medium sized. These slippers have unisex sizes (so if you are a woman, you may choose a size smaller), the reason why I ordered a size medium (size 7-8) when in fact I am a size 9. Excitement was my initial reaction when I first saw the slippers because I am dying to try it. 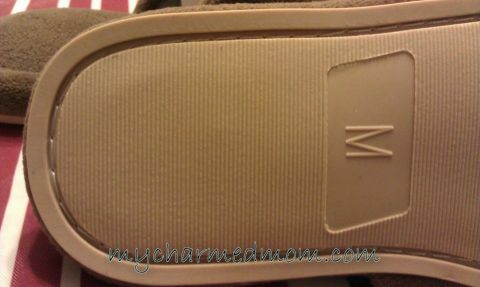 Judging by the way it looks (photo above), you can almost feel its softness on your feet. These slippers are made up of high quality genuine Nature’s Sleep Next Generation Memory Foam that naturally conforms to your foot in comfort. Aside from being a pressure-reliever, it also distributes your weight (to reduce pressure points) and help improve circulation giving you all day comfort. 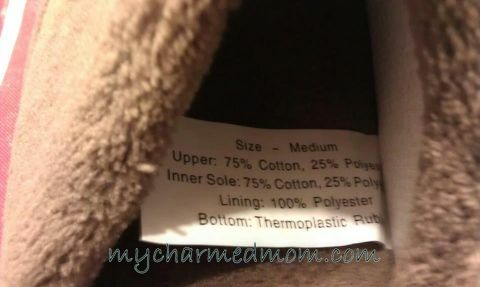 Honestly as I am writing this review, I cannot think of any other adjective aside from soft, comfortable, cozy, comfy. All these describe the experience of wearing these slippers. Take a walk in the clouds and slip your feet into these open-toe terry slippers. The visco-elastic memory foam in the bottom of the sole contours and cradles your foot for luxurious comfort and support with each and every step. The warm, soft terry fabric ensures your feet stay cozy all year round. Designed in the USA but produced in China, these memory foam slippers are made of genuine high density memory foam insole (inner sole : 75% cotton + 25% polyester) which gives that wonderful touch to your feet. In addition, it has a solid outer sole made of thermoplastic rubber, which is very durable as pictured below; while the lining 100% polyester. It is also CertiPUR-US® approved. If you will also notice the seams are made with perfection so you are assured that the insole will not detach from the outersole even if used for a long period of time. 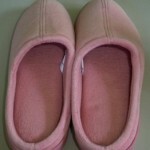 The materials that this slipper is made of is washable and can also be spot cleaned. 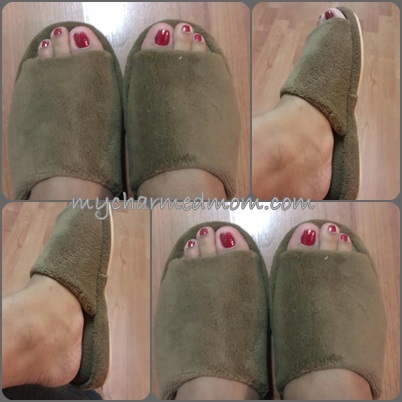 Truly the Nature’s Sleep Memory Foam Slippers brought me comfort most especially during the chilly season and kept my “always cold” feet snugly warm. I have been using flip flops inside the house before I got these but never again will my Foam Slippers ever depart from me. 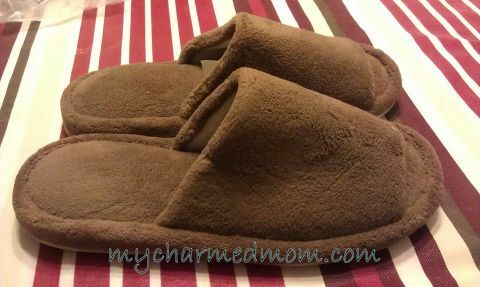 You can check out these slippers and get the same comfort and warmth I have experienced at the Nature’s Sleep website and use BEARS50 to get a 50% off using the code for any purchase off of the website. 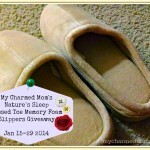 If you want to win these slippers stay tuned for a colorful giveaway on March 1st. 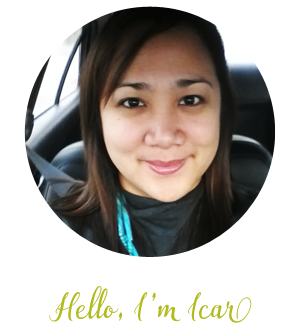 Note : This post may also contain affiliate links. Those look so soft and comfortable! I could use a new pair of slippers.